Bryan Loritts asserts that God's "kitchen" for building marriages is not equipped with a microwave. God delights in putting us in "slow cooker" situations where all of our accomplishments are of no value. It is in that "long hot" place we learn patience with our spouse. Bryan: There are times when I’m just in funky seasons in my marriage / in my life, and I’ve got to let what I know about God to trump how I feel—when I’ve got to command my emotions to line up behind the truth of who God is. Bob: This is FamilyLife Today for Tuesday, March 6th. Our host is Dennis Rainey, and I’m Bob Lepine. Could your attitude use a little adjusting today? Bryan Loritts says, “Remember who God is.” We’ll hear more from him in just a minute. Stay with us. Dennis: So, our listeners are going to have it brought to you as well today. Bob: I tweeted after the cruise—actually, I just followed up to a tweet I saw—Bryan had a very nice tweet with a picture of you and him, where he just talked about your influence in his life. Dennis: That was very nice. Bob: You’ve been spending time with him every month for the last 15 years; right? Dennis: That’s correct. By phone, we have a mentoring relationship. I’m privileged to have put a brick or two on the wall in the building that Crawford and Karen Loritts built. Bob: He was a part of the Love Like You Mean It marriage cruise, which just completed a few weeks ago. We wanted you to hear his message today; but we also wanted you to know that, if you’ve thought about being on one of these cruises, you need to get in touch with us quickly. We’re more than 70-percent booked for next year. We wanted to make sure that FamilyLife Today listeners had an opportunity to join us. In fact, I talked to a guy on the cruise this year, Dennis, and he said—he said: “My wife and I had been having this conversation. She said, ‘You know, we ought to do something more special for Valentine’s Day than what we normally do.’” He said, “We go out for a meal; but she said, ‘We’re not making a big enough deal out of Valentine’s Day.’” He said, “The next day, I hear you on the radio talking about the Love Like You Mean It marriage cruise. I called, and I said, ‘I think I’ve got it.’” So, they were on the cruise this year. —great locations / nice setting—but it’s really all about having a week where you can relax and be poured into from God’s Word. Dennis: I talked to a couple, who had gotten married about a year ago—were on the cruise kind of celebrating their 14-month anniversary, coming out of being newly married. We also saw two couples stand up in front of the entire audience, who between them, had one hundred years of marriage—two golden couples. 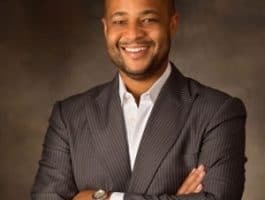 Bob: Well, the message we’re going to hear today from Bryan Loritts comes from the Love Like You Mean It marriage cruise that ended a few weeks ago. 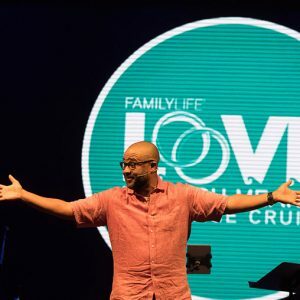 Again, if you’d like to join us on the cruise in 2019, you can go to our website, FamilyLifeToday.com, and the information is available there; or call us at 1-800-FL-TODAY, but do it quickly so that you can get a state room reserved and be with us next year. This message is from the Book of James. It’s all about how we need to practice patience/long suffering in our marriage relationships. One of the most frustrating things that could ever happen to an oyster is to have lodged within the confines of its shell a little, tiny piece of sand. Ninety-nine point nine times out of one hundred, this oyster is readily able of locating this little grand of sand and expelling it from off its premises and going about the day’s affairs; but now, there are those rare occasions, where try as this oyster may, it just can’t get rid of this grain of sand. It does everything it knows it can do to remove it from its shells; but there are just, again, those rare occasions where it just can’t seem to do it. situation / it just can’t get out of this circumstance; but it’s at this moment where a beautiful thing happens. You all know where I’m going with this. It’s as if the oyster shrugs its shoulders—as if oysters have shoulders—you know what I’m saying—and figures to itself, “If I can’t get rid of this situation and circumstance, I can maximize or make the most out of it.” It finds this grain of sand and begins to coat it over, and over, and over again with a liquid substance that, ladies, when it hardens, you pay top dollar for—it’s a pearl. You do know, at the end of the day, all a pearl is—is the fruit of a very frustrated oyster. [Laughter] If there was no irritation / if there was no frustration, there would be no pearls of great price. God has sent me here this morning to encourage every marriage in the context of a very dark world and give hope. He wants your marriage to be that great trophy of His grace. Ephesians 2:8-9 says, “We are God’s workmanship”—Greek word there, “poiema,” from which we get the English word, “poem,” there. Psalm 139 talks about the fact that we are fearfully and wonderfully made, and He has created you on purpose and for a purpose. Your marriage is under His providence. He has either decreed or allowed—you are together under His sovereignty—and He has an all-points bulletin, both, on your life and on your marriage to be a pearl of great price. God looks at your marriage; and He says: “I have got great plans for you; but in order to get you to a place of fall-off-the-bone blessing, I’ve got to stick you in My crockpot and slow cook you and put you in situations where you can’t change your spouse; put you in situations where your PhD or MBA can’t get you out of; put you in situations where the amount of zeros in your bank account can’t fix. —this instrument we use to measure heat or temperature—means anger. Literally—I love this—be patient means to be in a situation where you are long towards anger. You don’t learn patience when your spouse is being compliant. You don’t learn patience when your kids are being compliant. You don’t learn patience when the job and career are going well. You don’t learn patience when the health report is wonderful. You don’t learn patience when the money is flowing in. — [Laughter]—“waiting on You, God; waiting.” That’s not how that works. Instead—you understand how this works—this farmer goes to his field. He plows, and plows, and plows, and cultivates, and cultivates, and cultivates, and sows, and sows, and sows—back-breaking work, sun up to sun down, day in to day out, week in to week out—but he does all that, knowing that unless God sends the rain, his labor is in vain. The farmer understands that patience is never passive resignation; but it is always active participation. It is me doing my part, waiting on God to do His part, understanding that unless God sends the rain, I labor in vain. The biblical example of this is Paul. Did you realize much of Paul’s ministry takes place in a crockpot?—it’s called jail. Paul writes a series of letters from jail—a situation he can’t change / a situation he can’t get out of—but whenever Paul goes to jail, if you’ll notice, the first thing he does is he asks for a pen and some papyrus, and he writes churches. In each of these letters, we see him doing something else—he prays. In each of these letters, he tells them, “I want you to know I’m praying for you.” He writes, and he prays; and he writes, and he prays; and he writes, and he prays. Korie and I are going to be celebrating 19 years of marriage coming July. [Applause] There have been—like any other marriage—there have been great seasons and not-so-great seasons. We’re learning that one of the best things we bring to our marriage and family—one of the best parenting techniques / the best husband-ing techniques / the best wife-ing techniques—we could ever have is just to wife/husband/parent from our needs. It’s to realize: “God, we are not in control. In the midst of a crockpot, James just kind of slides this in here—he says, “Oh, by the way”—verse 9—“as you’re waiting, do not grumble.” Wow. Here’s James—he’s writing to the Jewish diaspora—it is ethnic Jews, who have since come to know Jesus Christ as Lord and Savior. I promise you—when they see the word, “grumble,” their mind takes them back to the days of their ancestors, who leave Egypt, headed to the promised land—what was supposed to be a six-week journey turns into a forty-year debacle. Why?—grumble, grumble, grumble, murmur, murmur, murmur. God says: “You know what? If you want to grumble, murmur, and complain, I’m going to add 39 years and 46 weeks to your journey.” But what delays them?—their attitude. I wonder how many marriages God is saying to this morning: “You should have been on the next chapter / you should have been in the next season; but instead of you trusting Me, you murmured, grumbled, and complained.” God gets ticked at our grumbling. Why? The same reason we get ticked when our kids grumble at us; because when we grumble, we fundamentally say, “God, we know better than You.” Grumbling, murmuring, complaining unleashes an assault on the sovereignty of God. So, what do I do when I find myself in my marriage / in my own personal life—when I’m in the crockpot and I’m in this season—I’m waiting on God, and it’s something that I can’t control? Maybe, I’m waiting on Him to do something in my spouse’s life / I’m waiting on Him to do something, maybe, when it comes to kids or the ability to have kids. Whatever it may be, what do I do? You know what’s interesting? Job teaches us that, when going through life’s difficulties, always let what you know trump how you feel. There are times when I’m just in funky seasons in my marriage / in my life, and I’ve got to let what I know about God to trump how I feel—when I’ve got a command my emotions to line up behind the truth of who God is. Job says, “I know my Redeemer lives”—patience. I grew up down South. My mom was into something called cross-stitching. Anybody here cross-stitch?—anybody here? Cross-stitching—for the longest time, I thought it was the most ridiculous, annoying hobby in the world. She would do this for hours. I remember, one day, going: “Momma; momma, I don’t understand. Why are you doing this? It doesn’t make any sense. There doesn’t seem to be any order—no rhythm, no rhyme, [and] no reason.” All of a sudden, Mom just smiled and patted on the sofa, next to her, and said, “Why don’t you sit down next to me?” When I did, I now saw things from the top down. When I looked at it from the top down, I saw order, and rhythm, and reason. Bob: That’s a great word from Bryan Loritts, the pastor at Abundant Life Christian Fellowship in Mountain View, California, in the Bay area. He joined us recently onboard the Love Like You Mean It marriage cruise. We all needed to hear his message that day. Dennis: I think a marriage needs outside stimulation to stay out of its ruts. There is a sign on the Alaskan Highway that says: “Choose your rut carefully. You’ll be in it for the next 200 miles.” [Laughter] I think a lot of marriages get in a rut. The way you get out and stay out is—you invest. You don’t invest a nickel and hope to get a dollar out of your marriage. No; you have to invest liberally in your marriage. —with speakers like Bryan Loritts, and Alex Kendrick, and next year, Voddie Baucham/Ron Deal—I mean, we’ve got some great speakers coming back. These are all folks that you can trust to come out of the Scriptures and will, indeed, stimulate you to love and good deeds in your marriage and in your family. Bob: Well, again, we wanted to make sure that all of you listening had an opportunity to join us on next year’s Love Like You Mean It marriage cruise—it’s Valentine’s week 2019. We’ll be going to Honduras, to Belize, to Key West; and as we mentioned, about 70 percent of our cabins are already booked. So, if you’re interested, now is the time to get in touch with us. Now, what is it you would say you treasure most in life? Tomorrow, Paul David Tripp will be with us, and we’re going to hear about how what we treasure most determines the quality of our marriage relationship. Hope you can tune in for that. I want to thank our engineer today, Keith Lynch. He got some help from our friend, Mark Ramey. On behalf of our host, Dennis Rainey, I’m Bob Lepine. We will see you back tomorrow for another edition of FamilyLife Today.